The goal of this post is to help you create a marketing strategy for current customers which utilises automated workflows and engaging content to deliver highly personalised and profitable marketing campaigns - making you stand out from the crowd. 3 key types of engaging content (with examples). How you should market content using the 2:1:1 rule in order to make you stand out from the crowd and boost your performance. How to create highly tailored and captivating automated marketing creating a cutting edge customer experience for your store. 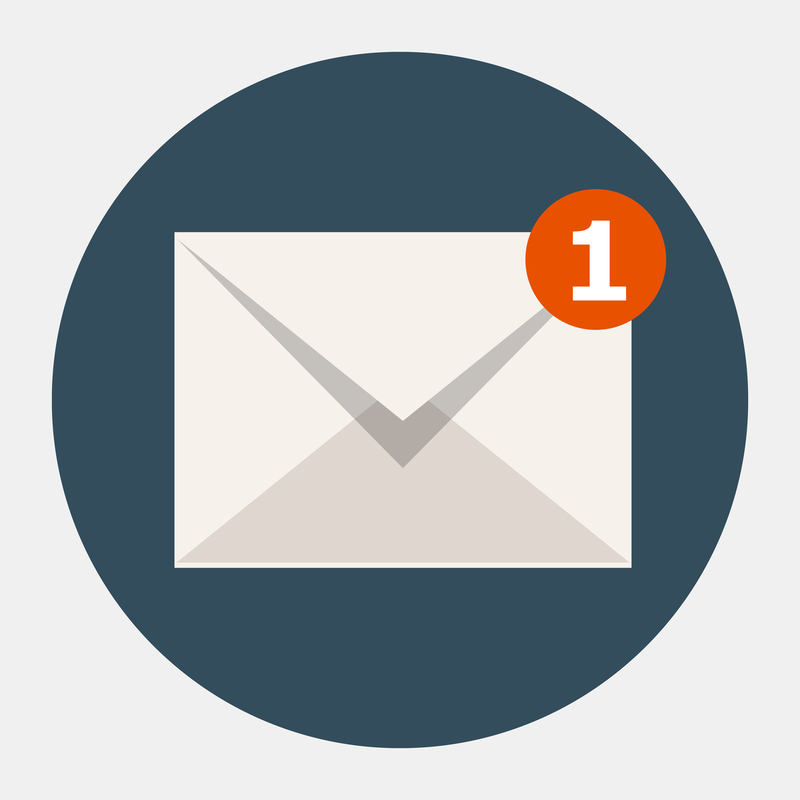 Most online retailers tend to only send promotional ‘hard sell’ emails. Something along the lines of, ‘Here’s our awesome new product x’, ‘Check out our new collection!’ or, ‘Here are our sale items’. One step better than this is to send product updates or offers that are personalised to previous transaction history and/or demographic information in an effort to become more relevant to the recipient. If implemented properly even defining whether or not to send men’s or women’s clothing promotions to each customer can result in a tremendous uplift in conversion. Typically this is as far as many ecommerce stores go nowadays. But in a world where it’s so difficult and expensive to grab attention we need to start thinking a step further ahead. You must stand out from the crowd and to do this you need to start selling a lifestyle or experience rather than just some products. This should resonate through at every touch point an individual or customer has with your brand - do this right and you will stand a world apart from your competition. But to embody this principle your marketing needs to be more than just hard selling your products. You need to intertwine your it with other types of content - soft sells and educational or entertaining content. Marketo, an automated marketing platform, developed something called “The 4:1:1 rule for lead generation”. The rule goes something like this: for every one self serving message you send, you should also include one soft promotion and four educational or entertaining messages. This rule was created for B2B companies, however it can be applied with great effect to consumer ecommerce as well. The only difference being that, in practice, I’ve found that 2 pieces of educational or entertaining content work better than the four suggested for B2B-related businesses. I’ve included the examples below to provide some inspiration about the types of content you can promote in your marketing to drive deeper engagement with your customers. Quite a few of these may only be suited to certain channels like email, but others can be used across social, display and more. Try things out, don’t worry about failing and find what really resonates with your customers. There’s an art to get this type of content right, as it requires a balance to be struck between creating content that appeals to your target market whilst still having a close connection to the products you’re actually selling. This will vary wildly depending on what you are actually selling however here are a few ideas that work well. Also, try and mix up the type of content you use, incorporating video, blog posts and even interactive content. This helps keep things interesting. A blog can be a great place to host a lot of this content - check out these great ones below. Harry’s blog - All things related to living a well lived life. So we’ve gone over some inspiration for what can be included in your nurturing campaigns, along with how different types of content should be linked together. Now we can start to think about creating them. One of the key touch points for targeting your current customers is email, however nowadays there are numerous channels that allow you to target specific segments of your customers such as custom audiences on Facebook or Twitter. When you’re creating marketing campaigns remember that you can experiment with combinations from numerous different channels. Let’s start by working on our strategy for one-off campaigns. Based on the work we discussed above on the 2:1:1 rule we can start to create a campaign structure. Let’s assume you are a fashion store selling both men’s and women’s clothes and you have a blog. Below is an example of how you could form a basic structure for your ongoing campaigns. It is also important to note that this channel shouldn’t be the same for everyone; you should tailor the one off messages based on individual customer data such as whether they’re male or female or have a particular fondness for product range x. You can become steadily more focused as you obtain more and more data about specific customers and their preferences. Once you have a basic structure, you can use a marketing calendar to plan your future email campaigns. The bigger your customer base and larger your marketing team, the more segmented campaigns you can run that deliver more relevant and therefore more effective marketing campaigns. This is just the main channel of marketing messages, it is bolstered by automated campaigns that branch off from the main channel. These automated campaigns are triggered by specific user actions or criteria. You can create highly-relevant content for a specific individual using automated workflows, which also allow you to send content at the most appropriate time. For instance, you wouldn’t randomly send buyer guides to all customers but it makes sense to send one after a trigger such as a customer viewing a particular product page for over x seconds, adding a particular product to their wish list or after buying product (y) which is closely related to product (x) which you have a buyer’s guide for. New to repeat customer: A campaign that is triggered after new customers sign up, that has the specific intention of increasing the likelihood that a one time purchaser becomes a repeat purchaser. Bought x product: If someone buys a product that you also sell accessories for, send them follow up emails with these highly affiliated products. For example, if someone buys a winter coat you could send them promotions for gloves and scarfs. Post purchase product info: After a purchase you can send customers ‘how to’ instructional videos, product care information or the opportunity to upload a picture of them using their new product which can be featured on your site. Churning hero customer: For high value customers who are at risk of churning you can try sending them a soft sell offer to reactivate them before they are completely lost. An example could be sending them the opportunity for a personalised shopping experience, like the Topshop example mentioned earlier. There are many different workflows you can create to improve the user experience and really show off your brand. The next step is to make your automated workflows smart. You do this by creating ‘if this then that’-style branches off of your default workflow. The concept behind this is to add another level of relevance on top of the default option. Once a workflow is triggered you can implement a rule to take an individual down a different branch for a while and then potentially link them back up to the default workflow depending on how long the workflow is. 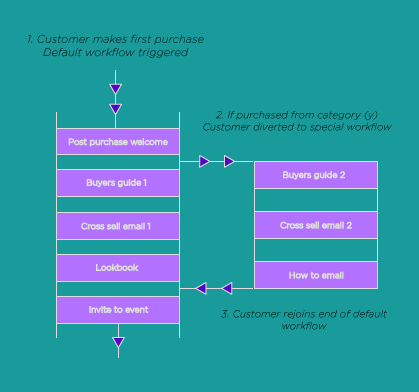 The example below is of a standard workflow for trying to convert a one-time purchaser into a repeat customer. In this particular workflow, if they first bought from category x they will be taken down a slightly different path, which is set up to promote more meaningful products to them. Bear in mind that this suggestion may not improve conversion for your store. You should be setting up and testing different experiments to slowly discover more about your target market and their preferences. You can then really hone in on the type and level of personalisation really moves the needle for your online store. Good luck creating your new marketing campaign structure and testing out automated workflows! Please let me know how your experiment go in the comments below or feel free to ask me any questions.